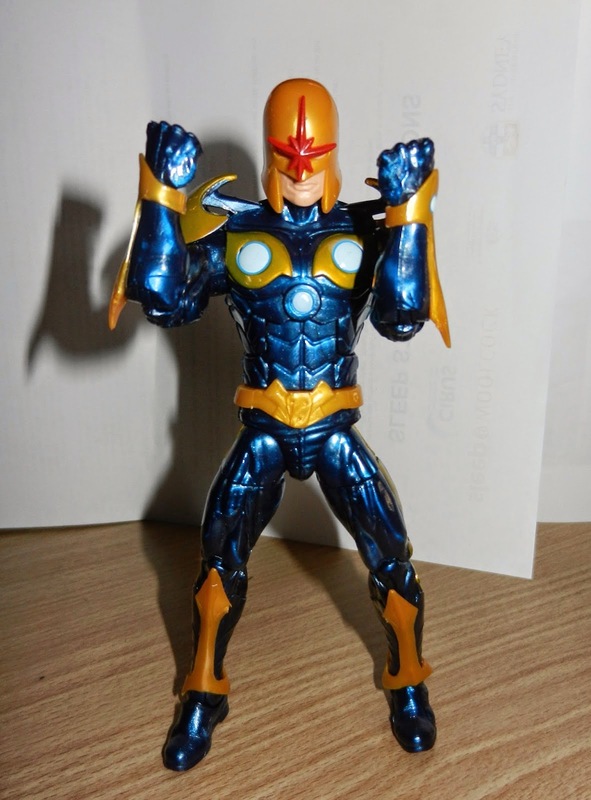 NOVA: He's a 90% original sculpt, with things like the feet, thighs and upper arms the only re-use i can see. Everything else is brand new. 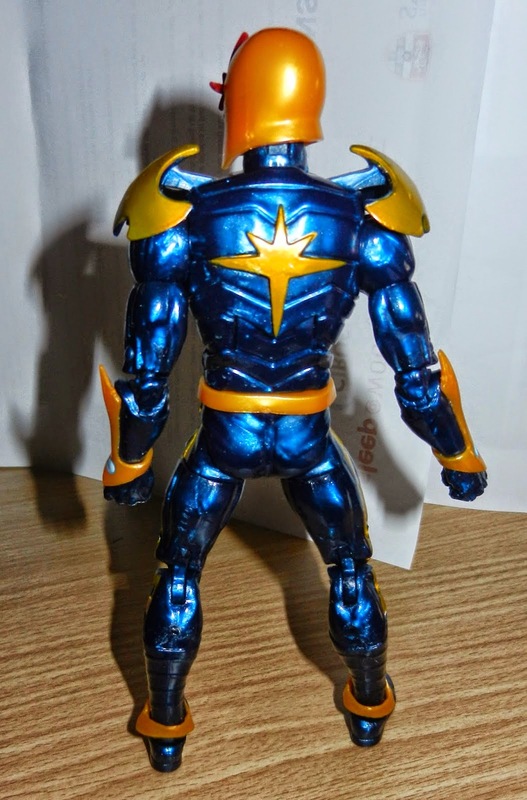 His helmet and some raised gold elements are cast in metallic gold plastic, and the rest of him is a deep metallic navy, that kind of plastic that has metallic plastic mixed into the navy blue in the casting process. His face is painted flesh and the red star on his helmet stands out and is cast in red plastic. 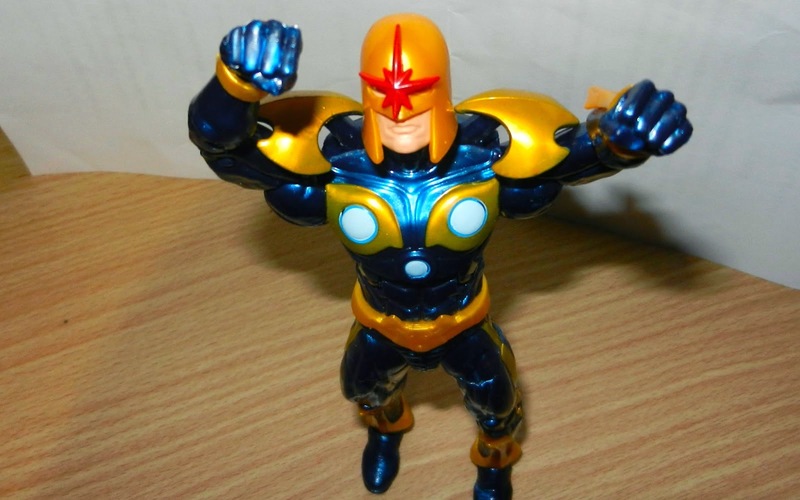 The head is separate from the helmet, and his face seems fully sculpted underneath. You can really tell which bits are cast in gold and which ones were painted. 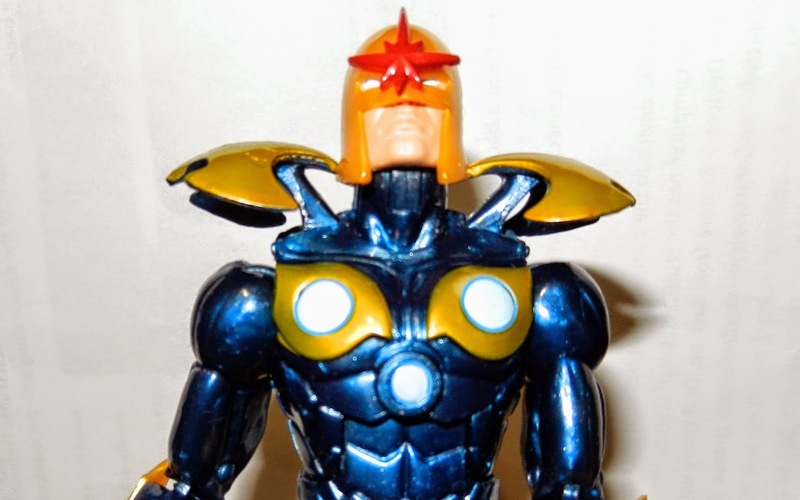 The blue orbs on his chest and forearms are very light blue with a painted darker edge around the outside. 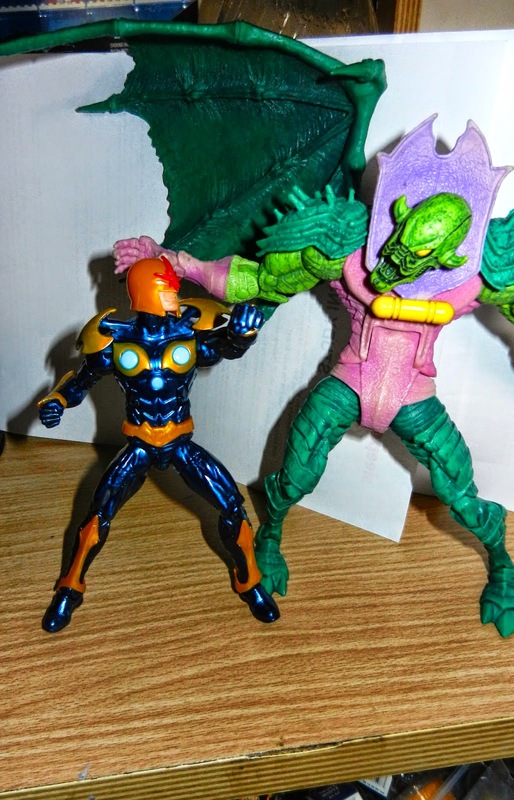 His articulation is mostly great. Ball hinge feet, double jointed knees, swivel thighs, ball jointed hips, swivel waist, ab crunch, swivel balljoint neck/head, double jointed elbows and balljoint shoulders and wrists. The shoulder-pads are made of a softer plastic that a lot of his armour is made of, (And are on little swivels) but not soft enough for him to get his arms up to achieve that classic flight pose, though his head does allow for a good position. 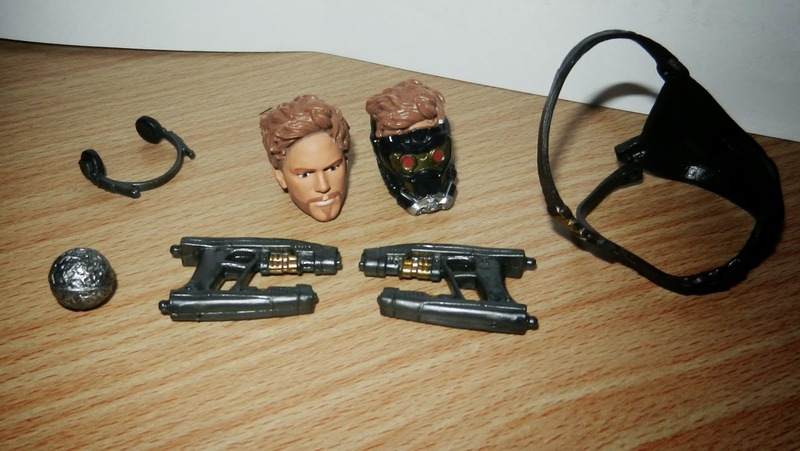 STAR-LORD: I remember thinking when seeing the first pictures that they were going to just reuse that old Punisher mold. I’m very happy to report that he’s a 100% new sculpt, and from what I can tell from the rest of the line he’s got the lion’s share of accessories too. 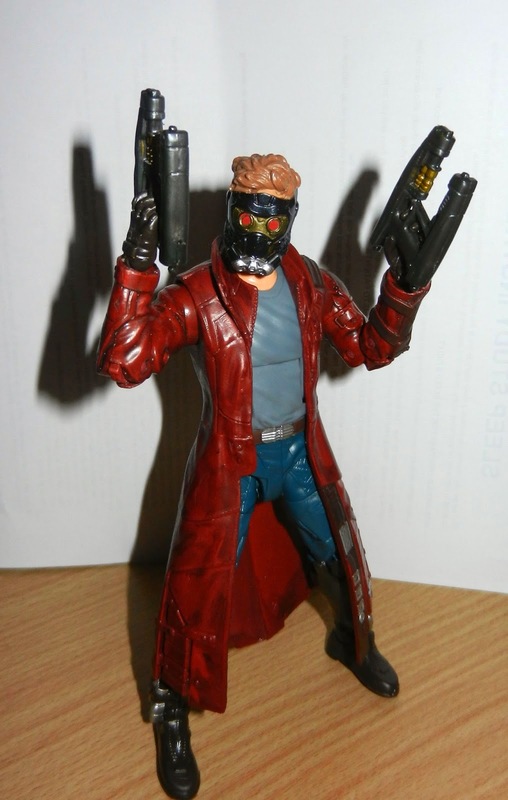 He comes with the alternate head, removable satchel, his twin pistols, and that strange orb he was stealing at the beginning of the first trailer (not the orb he shakes up and lets free for light). He also has his headphones for listening to his classical music. He can’t hold the orb all that well and the guns don’t stay in as strong as I’d like them, as the fingers are soft. 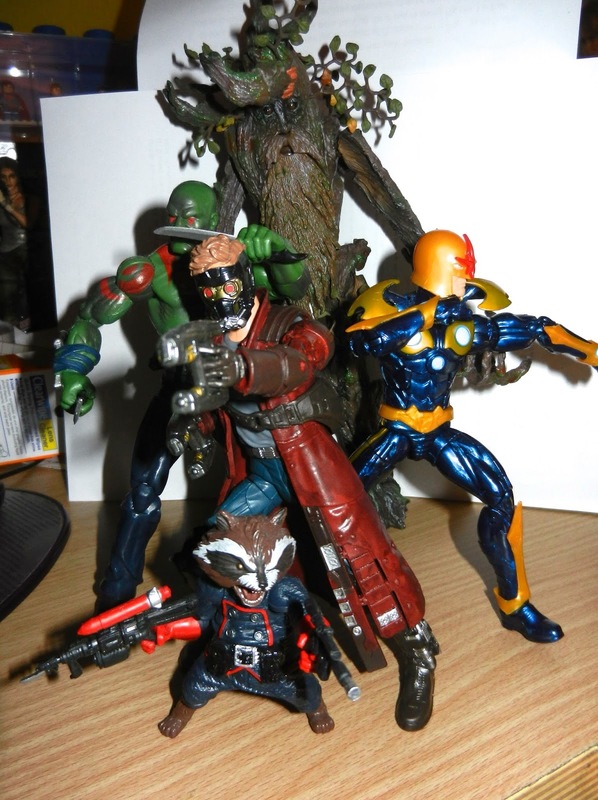 The sculpt is great, and like I said all brand new. He even has the rocket boosters we’ve seen in the trailers and TV spots; they even went so far as to sculpt the buttons to fire them. The paint is strong. 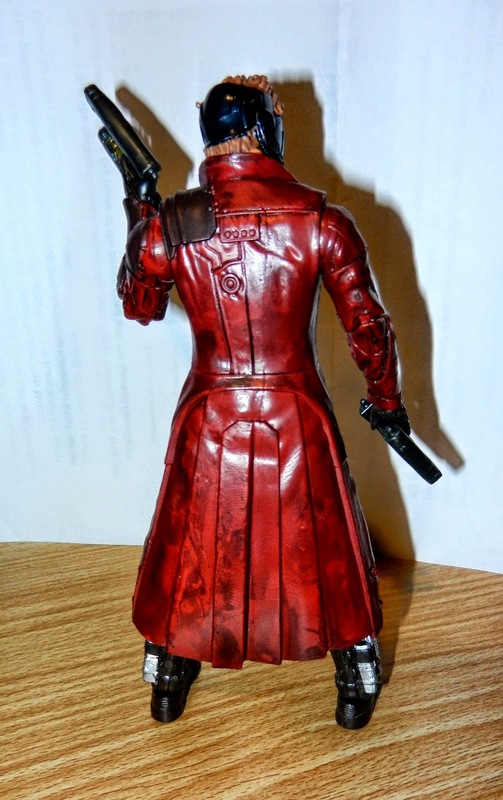 He has silver highlights on the rocket boosters, some square elements on his coat and his belt buckle. He’s wearing a bluish grey t-shirt, and his coat, covered in a wash to make it seem more dirty and leathery, has brown leather parts on his shoulders and a brace on his left arm. 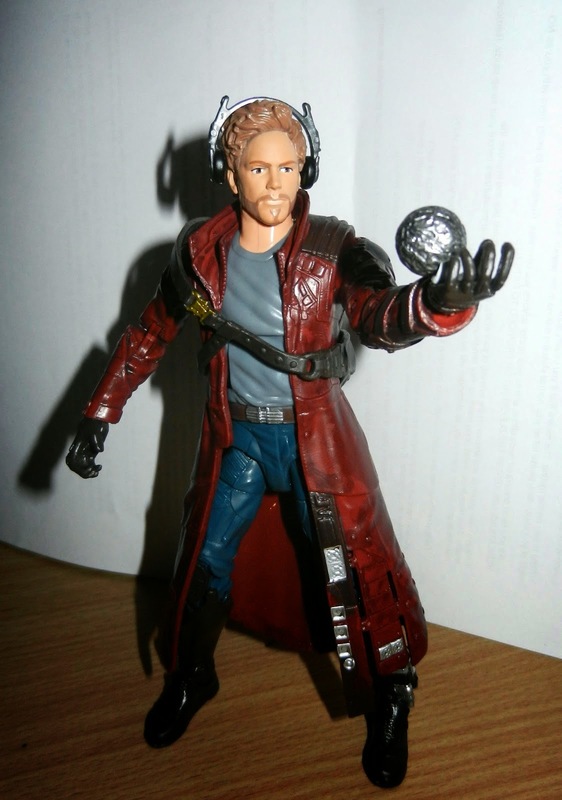 The paint on the unmasked head is ok; I think it’s the paint on the eyes that make him look less like Chris Pratt. 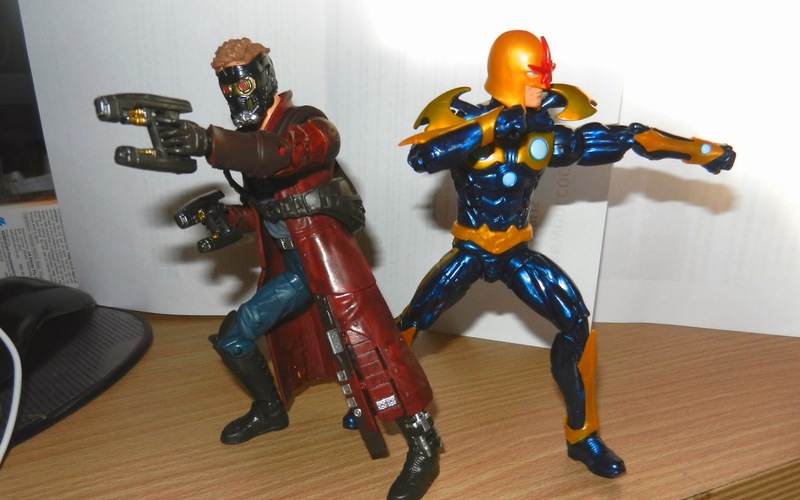 The mask head is better, the mask looks great but there’s a bit of slop with the red eyes. He has ball hinged feet with ankle pivot, double-jointed knees (with cool kneepads) swivel cut thighs, ball hinge hips, swivel waist, ab crunch (with limited range) ball swivel neck/head, cut swivel biceps, ball jointed shoulders and wrists and double jointed elbows. So he’s pretty stocked in the articulation department. 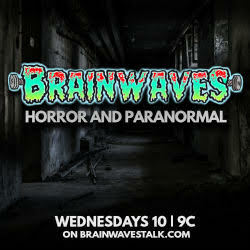 Thanks to Anthony Soegito of Ant Reviews for access! 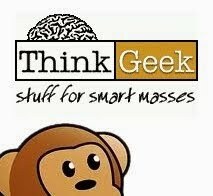 Hit his blog for more thoughts on each character. 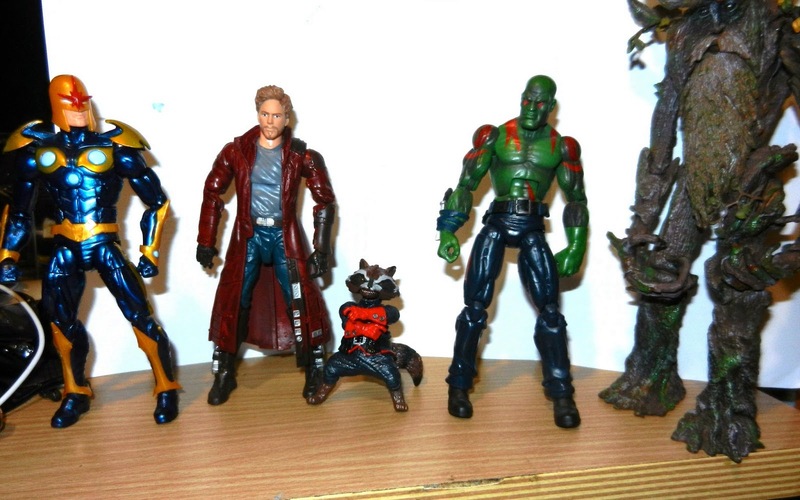 Click HERE to pre-order your own 6 inch Guardians of the Galaxy action figures!